A staggering 83 million Americans are sleep-deprived, and new studies come out almost daily reporting that not getting enough quality shuteye can cause both immediate and long-term health problems. If you’re not getting enough of restful bedtime, you’re at higher risk for a wide array of issues, including obesity, Alzheimer’s disease, chronic pain, and illness. Today’s busy lifestyles, long working hours and endless to-do lists mean that it’s more challenging than ever to fit this activity into our schedules. And even when we do manage to get some rest, are we falling into the deep sleep that our bodies need to repair and restore? The chances are that the thoughts and stresses of the day are creeping into our bedrooms and preventing us from getting the restful nights we desperately need. But what if there was a way to accurately track and monitor our sleeping patterns to know if we’re getting what we need. And better yet, if we’re not, what if we could help train and coach our bodies to sleep properly? With a quality sleep tracker, that is finally a possibility. In this article, I’m going to share with you the best types of trackers I’ve found, and give you all the information you need to find out which one is right for you. To monitor your sleep, you’ll need a device that can monitor your movement, monitor your cycle (whether it’s light, deep or REM sleep), and then report on how much and well you slept throughout the night. Armed with this data, you’ll have an objective report of how well you slept and when and where you can work on improvement. When done over consistent periods, you can even begin correlating with real data the quality of your bedtime with your energy and focus throughout the day. Professional athletes also use this information to plan how they structure their workouts! Because the quality of our bedtime is now known to be a key component in achieving and maintaining a healthy lifestyle, we can expect to see these trackers become more mainstream in our culture. You can get started with a free app, or splurge two to three dollars for a paid sleep-monitoring app. These apps are available for iPhone, Android, and the Apple Watch. While this is an economical way to begin looking at patterns, user reviews are mixed. Users agree that the reports generated from the smartphones and Apple Watch are accurate regarding time in and out of bed, but they have found that the actual sleep-tracking portion doesn’t yield consistent results. Another issue with a standalone app is that it’s not sophisticated enough to know if the movement is coming from you or your partner, so these are a no-go for couples. If you’re serious about monitoring and improving your bedtime, a specially designed tool to track your activity is the best bet. Wearable technology is a becoming a huge trend, so it makes sense that we would now be able to wear a sleep tracker. The advantage of these wearable devices is that they serve double duty as a fitness and activity monitor and GPS. These compact, watch-like accessories often include capabilities like calorie intake, heart rate monitoring and activity and movement throughout the day. Just in the last few years, the technology of the wearable trackers, as well as the aesthetic, have vastly improved. They used to look like hunks of plastic bands around someone’s wrist, but now they have a more streamlined and fashionable look in the form of a stylish watch, and in some cases a bracelet, that should jumpstart adoption of these devices. Non-wearable tracking means putting a device in your bedroom to track and monitor sleep. These often consist of a thin band with a sensor that you attach to your mattress or under your sheet. The device will then measure a variety of metrics, like heart-rate, respiration, as well as the standard movement both in and out of bed. Some of the products in this category also include enhancement options like special lighting effects for waking and sleeping, smart alarm clocks based on your cycle, soft music and even warming features to help keep your bed at an optimal temperature. There are also brands that don’t require you to place a sensor in your bed. These are stand-alone trackers that you put on your night table, and they monitor even the most subtle of body movements. This device combines an activity monitor and a sleep tracker all in one. Plus it doubles (or should I say triples?) as a watch. It has an elegant, easy-to-read touch screen that shows you all the relevant information in one beautifully designed interface. The Fitbit Charge also takes a holistic approach to health and fitness by including guided breathing sessions, reminders to move, a calorie burn tracker and reports on cardio fitness level. It also boasts a long battery life, at up to five days. This tracker is currently one of the pricier ones on the market, but it has the most functionality out of all the competitors. 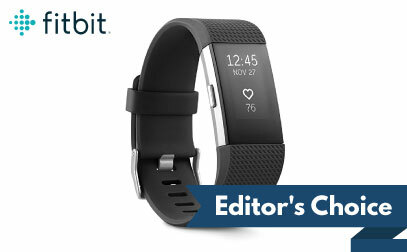 Despite the higher price point, many users continue to flock to the Fitbit Charge and agree that it gets top marks for accuracy and ease of use, which are both highly ranked requirements. The band is thicker than other wearable devices. Sensitive to sweat, which sometimes means the device can’t detect your heart rate. 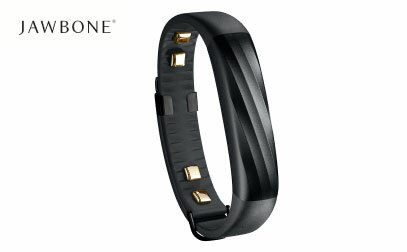 The Jawbone UP3 boasts the ability to distinguish between being awake, as well as light, deep and REM stages of sleep. It paints a vivid picture of your overall activity using sensors that measure heart rate, breathing rate, body temperature, bioimpedance (related to body composition and electric current flow) and galvanic skin response (basically it measures sweat due to stress while you’re unconscious). At the lowest end of the price spectrum, the Jawbone UP3 is a fantastic device to start with to test the concept of tracking your bedtime. It also has an extended 7-day battery life. Some users complain that the clasp comes undone, causing the Jawbone to fall off. No automatic tracking. Must be set each night and reset again if you get up to go to the bathroom. 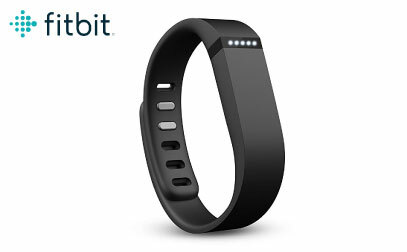 The Fitbit Flex is similar to other wearable trackers, with one notable exception. It has a light-up scoreboard, which consists of a row of lights that illuminates as you get closer to your goal. Not technically sleep related, but cool, nonetheless. It is also one of the only devices to make a water-resistant claim. This benefit is important for people using these to track exercise activity as users sometimes report inaccuracy or lack of reporting due to sweat. Like the other wearables mentioned, the Fitbit Flex has the standard features you’ll find in most devices, including a decent battery life, auto sleep, silent alarms and wireless syncing with your smartphone and computer. Inexplicably, this doesn’t include a heart-rate monitor, but if tracking heart-rate isn’t a requirement, this device could be a winner. 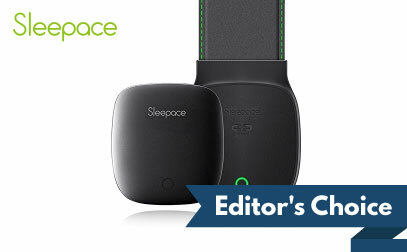 While modern tracking devices bulk up their offering with a bunch of add-on features, the Sleepace Reston prides itself on being a dedicated tracker. It consists of a strip that lies underneath your fitted sheet and has a magnetic clip that holds it in place. This brand is one of the most sensitive and accurate trackers on the market and claims to outperform any of the wearables. 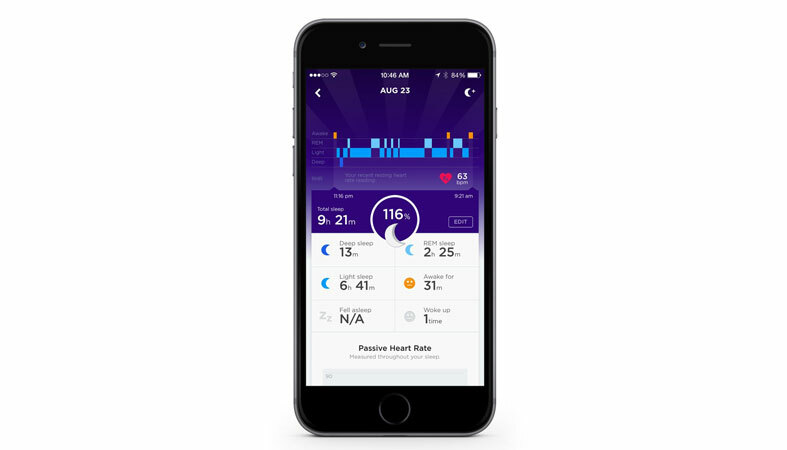 In addition to monitoring real-time heart and respiratory rates, the Sleepace Reston also includes a consultation feature that provides tips for exercise, diet and sleeping habits. One of the fan favorites of this device is the level of detail in the reports. For example, not only does it tell you your heart rate, but you’ll also get to see the average as well as your highest and lowest rates. Sleep apnea sufferers will also get reports or any apnea episodes. Keep in mind that this does require a smartphone to be able to view and read the reports, but that is standard for the non-wearable trackers. There’s an app that connects to Bluetooth, which is the recommended way to use the Sleepace Reston. This is an all-in-one device that includes a tracker, alarm clock, reading lamp, sleep machine and wake-up light. It comes with two components: a bedside lamp and clock combo that looks like a submarine’s periscope and a thin sensor pad that monitors your patterns from under the mattress. 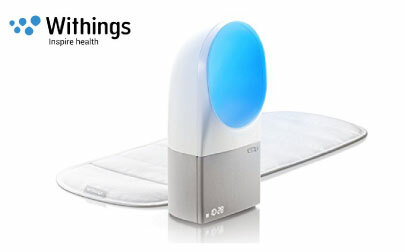 The Withings Aura is almost like a virtual sleep assistant because it helps improve your transitions in and out of sleep with a combination of sound and light effects. Plus, it has a feature called sunset lighting that helps relax you as you drift off. The makers of this device have thought of everything, including the use of colored wavelengths that help stimulate the secretion of melatonin in your system to help you fall asleep, while decreasing it when it’s time to wake up. Another unique feature is the ability to limit your exposure to electromagnetic airwaves. You can do this by plugging in your smartphone to charge the station, which will then shut off the Wi-Fi and Bluetooth. Known for making sleep apnea devices, ResMed now has a tracker called the S+. 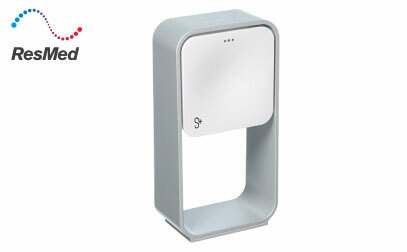 It has a sleek design and sits on your bedside table and does all the work of the other non-wearable trackers without the strip under the mattress. This revolutionary technology is key for those who don’t feel comfortable with a strip of sensors directly underneath their body. The S+ by ResMed works using sonar to monitor your breathing patterns by tracking the movement of your chest. It has a significantly lower price point for a full suite of features. Some users have faced challenges in pairing and re-pairing the Bluetooth, but most people agree that this is a tracker that packs a powerful punch of features without a high price tag. Consistent issues with users trying to sync the device. Must be checked regularly for pairing. Actigraphy measures just one metric: movement. It’s the method that is used in personal tracking devices. Usually, this is measured by wearing something on your wrist that measures and records your general activity level. While it’s not considered as accurate as the more sophisticated clinical methods, it is quite popular because it’s a cheap technology to obtain and it’s easy for the layperson to use on an everyday basis in a natural environment. The accelerometer is what makes actigraphy work. It utilizes a technology called MEMS, which stands for Micro-Electro-Mechanical Systems. MEMS are miniature sensors, or transducers, that convert a measured mechanical symbol into an electrical symbol. The accelerometer chips are incredibly tiny and are quite commonplace in a variety of everyday items. They’re prevalent in iPhones, appliances like washing machines and even those light-up shoes that all the kids are wearing. Because accelerometers are inexpensive, they’re common in the tracking field even though movement is not actually the best way to measure behaviors. However, newer technologies are emerging, including heart rate monitoring, which provides a more accurate picture of sleep quantity and quality. One of the reasons heart rate has become such a key tracking metric is its ability to provide information about the various stages of cycles; including light, deep and REM sleep. The technology is able to do this because each stage of sleep has a distinctive heart rate. It doesn’t always correlate one hundred percent with the subject’s exact cycle, but it’s much more accurate than an accelerometer alone. There are four ways to measure heart rate, and depending on your tracker, the method will vary. Measuring brainwaves is done using EEG, also known as electroencephalography. It’s a noninvasive procedure that records the electrical activity of the brain. In the field of sleep monitoring, it’s used to diagnose sleep disorders as the waves obtained through the recordings can track waking and sleeping states. Using an EEG monitoring method, scientists can also observe when a subject is in REM sleep or other cycles. To obtain an EEG recording, scientists place numerous electrodes (up to 256!) on the subject’s scalp and attach each electrode to an individual wire, which then connects to a monitoring station. The patient will also have a conductive gel or paste applied to their scalp, which as you can imagine, makes for quite an attractive image. The tracking devices designed for the masses are compact and streamlined in an artful combination of form and function. That is a big contrast to how the professionals track sleep. In a lab setting, the experts hook the subject up to an array of wires, tubes, and electrodes all over the body. The equipment tracks dozens of signals to get the most accurate report of the subject’s activity. This process is called polysomnography, or PSG. In case you’re wondering, it’s a Latin-derived word. While mass-market trackers tend to be limited to only body movement, heart rate, and some other superficial measurements, the professional studies also measure brain waves, eye movement, muscle tension, oxygen levels, airflow and the volume and frequency of snoring activity. If you’ve pondered whether all those wires hooked up to someone’s body in a clinical type of setting would interfere with their natural patterns, you’ve identified the number one criticism of professional sleep monitors. Still, it’s considered the most accurate and thorough way to be able to track your bedtime. How Accurate are Personal Sleep Monitors? While nothing is as precise as a professional assessment, modern trackers are surprisingly accurate. Previous generations of this technology would mistakenly measure the hours you spent lying awake, but not moving, as sleep. Now, however, the applications have improved and currently utilize a heart rate monitor as a sleep indicator in addition to movement. As an added benefit, these programs also contain features like motivation and sleep coaching to help you sleep better. The statistics about sleep disorders and the disastrous side effects of not getting enough shuteye are staggering. In the US alone, it’s estimated that between 50 and 70 million adults have a sleep disorder. Perhaps what’s even more alarming is that 100,000 deaths occur each year in US hospitals due to medical errors, and sleep deprivation has been shown to be a key contributor this number. Sleep tracking is not just a safety measure. Countless numbers of corporate professionals, athletes, and even parents rely on these trackers to know how much shuteye they’re getting and what level of quality it is. And even if you don’t plan on tracking your bedtime in any serious way, wouldn’t it be fun to measure what’s going on with your body throughout the night? How much would you pay for a night of blissful sleep? For what amounts to just a few dollars per day over the period of a month, you can get something that will help you improve your bedtime. 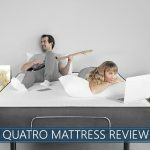 They say that what gets measured improves, so by tracking your bedtime and taking an active approach to sleep enhancement, you can experience a vast difference in the quality of your life without having to spend a lot of money. Sleep tracking is not just a safety measure. It’s an overall quality of life improvement. Imagine, waking up each morning feeling energized and refreshed, even if you didn’t get quite as much shuteye as you wanted. Think about how satisfying it will feel to see your metrics improve over time and be able to directly attribute that to better moods, more focus, and a higher overall performance. Hi David. We are just getting started on investigating all the new trackers and sleep monitors out there. In your father’s case, I’d highly recommend speaking to your doctor about this issue to see if he/she has any medical grade products that he/she would recommend.